There is a sort of perverse martyrdom that comes with some sports and the destruction of their hands. I've seen this primarily in judo and CrossFit, and even I've been sucked into the cult-like bravado of "I've worked so hard, my hands are THIS messed up!" Then I started competitively weightlifting, and it was brought to my attention that this line of thinking wasn't just silly, it ran counter to your goals as an athlete. For each day that your hands are blistered, that callouses are broken, or that they hurt so much you can barely grip a bar, that's a day that you can't work at your prime and that your thoughts are not on simply achieving your goals, but on trying to achieve your goals through a self imposed obstacle. Business studies have shown that multi-tasking only serves to lower the productivity and quality of the multiple things you're trying to set your mind on. Same goes for in the gym. So here are some really simple ways to take care of your hands and decrease the frequency with which you're having to focus your mind on something other than your ultimate goal. Chalk is meant to dry out your hands for a better grip, and this process will also dry out your callouses and make them more brittle and more prone to tearing. While chalk helps you grip the bar as you start to sweat and as weights get heavy and hands get tired, there is no reason for chalk during warm up sets or with lighter weights. And there is no reason for any more than a light dusting of chalk to dry up your grip. Excessive use of chalk no only leaves a mess where you are working, but causes excessive dryness and put your callouses more at risk for tearing and cracking. 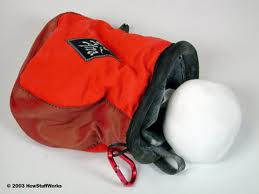 I used to use a rock climber's pouch with a hose-like ball full of chalk. Rolling that around in my hands provided enough chalk for a good grip, without coating my hands and leaving chalk all over the gym. I'll be the first to admit, this isn't the most luxurious of hand lotion. It has no smell, and until it's absorbed by the skin there is a certain tacky quality to it. But it is super effective at making callouses very soft and keeping them soft for some time. I will use this after I've whittle down my callouses, and at a workout before I put chalk on my hands. Callouses have a tendency to dry out, and when they are dry they are far more likely to crack and tear. Keeping them soft and pliable, especially at the gym, is going to save you the strife of cracking and tearing in the middle of a workout. 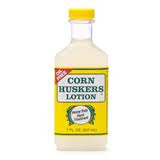 Even if a callous has already begun to pull away from your hand, using Corn Huskers can keep it from progressing before you can properly take care of it. 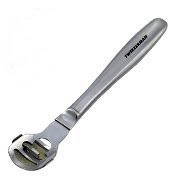 For most people, this simple device, $10 at most drug stores, is sufficient to keep callouses down. You don't want to get rid of your callouses, but if they get too thick, they're far more likely to tear off, and usually they tear off deeper than you want them to. You want to use the Ped-Egg either in the shower, or immediately after, when the skin is soft. For those of us (namely me) who get callouses like we're a prehistoric creature, sometimes the Ped-Egg isn't enough. I learned about these callous razors when I was a dancer and judo player and my feet were more hoof-like. They are designed with an angle and slight curve so they only take off very thin layers of skin, and once the skin reaches a certain curvature, it can no longer reach to shave more skin off. Used too vigorously, you can still cut yourself, and for many people it might take too much skin off, but I've found these to be a life saver. Again, only use after a shower when the skin is soft.